List manufacturing and technology advances that are streamlining modular precast concrete wall enclosures. Discuss the components of lightweight modular precast concrete wall systems that contribute to high-value green building rating systems. Identify thermal requirements of a manufactured wall system that provide continuous insulation and thermal gap protection in all climate zones. Compare a variety of buildings designed to take advantage of lightweight modular precast wall systems in projects that range from renovations to new construction and traditional to modern design. A dramatic LEED-certified high-rise office in Coahilla, Mexico, the Insignia de Saltillo is composed of 718 skewed parallelograms. Ironically, this building unites the most recent advance in lightweight precast panel technology with a facade designed to emulate the interweaving of fabric banners of the Middle Ages. From the building of the aqueducts to the construction of skyscrapers, advancements in technology and manufacturing processes have made concrete and subsequently precast concrete panels some of the most versatile materials on the planet. The Insignia de Saltillo designed by Cuatro 44 Architecture is the first LEED-certified building in Coahilla, Mexico. The 718 skewed parallelograms provide an energy-efficient facade composed of lightweight precast concrete panels. Driven by the demand for new housing in the 1940s and 1950s, European engineers developed a method of precasting concrete into panels modularized and built in factories as an economical means to faster and more durable construction. By the 1970s, insulated concrete sandwich panels were a common part of a contemporary architect’s design palette. They were a go-to material for economical load-bearing walls in housing and commercial buildings. As manufacturing and technology advances began to lighten panel enclosures, composite thermal panels were developed to meet new demands for energy efficient buildings. 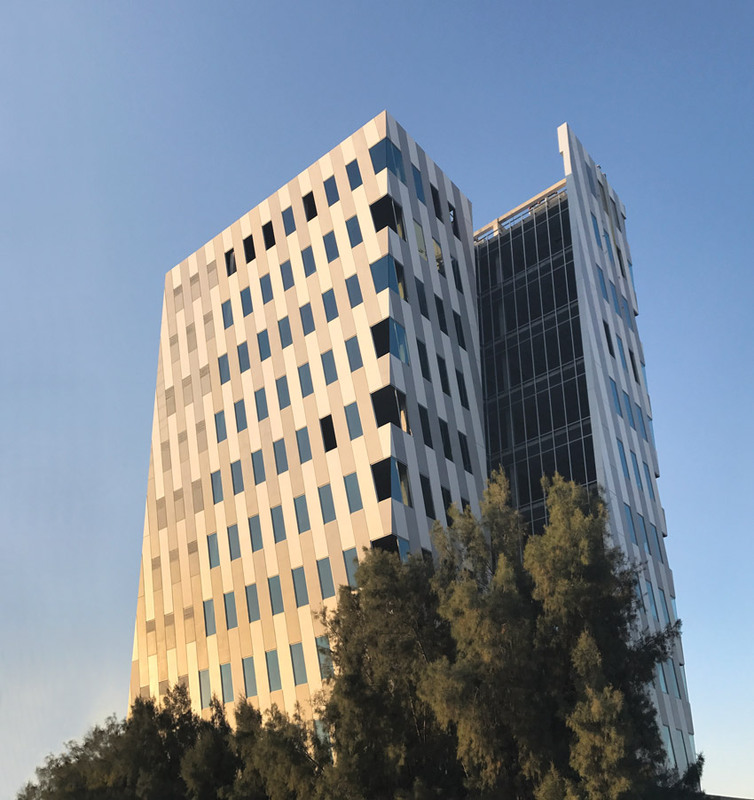 According to Art Miles, president of Easi-Set Worldwide, “Off-site prefabrication and modularization of lightweight composite precast facade assemblies has revolutionized the building construction process. They provide solutions that deliver maximum value to owners by integrating design optimization, financial savings, factory-controlled quality, improved site safety, higher energy performance, and ecofriendliness that fit squarely into the lean building model.” While architects were searching for building materials that met green building performance ratings, manufacturers were also investing in efficient ways to build lighter, stronger buildings that reduced waste. By the 1990s, many manufacturers began to implement lean manufacturing processes striving for ways to streamline construction. Manufacturing and technology advances are part of the story as to how “heavy” precast building systems became the streamlined modular precast wall enclosures used in sustainable buildings today. In addition to the increased use of technological solutions and industry advances, architects are adding value for owners by using an integrated design process. This process includes the early coordination of design aesthetic, performance, and scheduling goals with contractors and material suppliers. Within the past 20 years, innovative architectural precast designers began to look at ways to make panels lighter (e.g., removing the 4 to 6 inches of structural concrete behind the 2 inches of architectural precast face mix). They have incorporated in its place functional features (e.g., perimeter framing, insulation, and drywall ready) while maintaining the ability to introduce reveals, projections, and true brick finishes. These lighter panels could also be made larger, thereby reducing the number of loads shipped to the site and speeding building envelope completion. Additionally, the movement toward off-site manufacturing in a controlled environment reduced site construction costs, reduced waste, and improved cladding quality. Another benefit of these lighter-weight panels is that they can also be used to reclad existing buildings using the as-built foundation and superstructure. Industry has invested in the development of turnkey products that dovetailed into the concept of energy and waste reduction and the economical and efficient use of materials for the green building movement. “Reduce, reuse, and recycle” has become a design and engineering criteria for building materials. Over the past 20 years, The American Society of Heating, Refrigerating and Air-Conditioning Engineers (ASHRAE) has published increasingly stringent energy standards that require energy modeling and continuous insulation. These standards are embedded in the International Energy Conservation Code(IECC) and used as a criteria for many regulatory agencies as well as green certification programs. ASHRAE 90: Prescriptive Wall Insulation Requirements prescribes “insulation that is continuous across all structural members without thermal bridges other than fasteners and service openings. It is installed on the interior, exterior, or is integral to any opaque surface of the building envelope.”1 Off-site, factory-controlled materials are key to meeting ASHRAE standards and can provide financial and environmental benefits to project teams. Protecting the environment while conserving resources is embedded in today’s lean manufacturing. Panelized lightweight precast concrete panels are part of a growing industry of efficient, sustainable building systems made possible by 21st century technology. The ÉTS School of Technology Student Residence in Montreal, Canada, was developed jointly by the ÉTS construction and operations teams, architects Régis Côté and Associates, structural and civil engineers Pasquin St-Jean and Associates, and electromechanical engineers Beaudoin Hurens. The general contractor Groupe Decarel met a fast-track, 18-month deadline by installing factory-assembled, lightweight precast concrete panel systems complete with windows, thermal enclosure, and perimeter framing as part of the LEED Gold application. A lightweight precast concrete sustainable wall enclosure provides thermal efficiency, minimizes waste, increases performance, and streamlines the construction process. New composite systems are developed with the aid of high-tech digital fabrication systems and the direct exchange between architects and manufacturers to ensure design integrity. These precast concrete panel systems are built in temperature-controlled factories with digital tools that measure and monitor thermal performance to meet The International Energy Conservation Code thermal requirements from zones 1 through 7. New wall systems include 2-inch concrete enclosures developed to match traditional as well as modern aesthetics. They can weigh up to 60 percent less than traditional precast wall systems. These concrete precast walls are modularized to include the facade, moisture/air barriers, insulation, and, in some examples, windows and interior framing. The complex wall enclosures designed for the 10-story Insignia corporate offices in Mexico and the ÉTS School of Technology Student Residence in Montreal, Canada, demonstrate the wide array of performance values that can be achieved in both northern and southern climates. 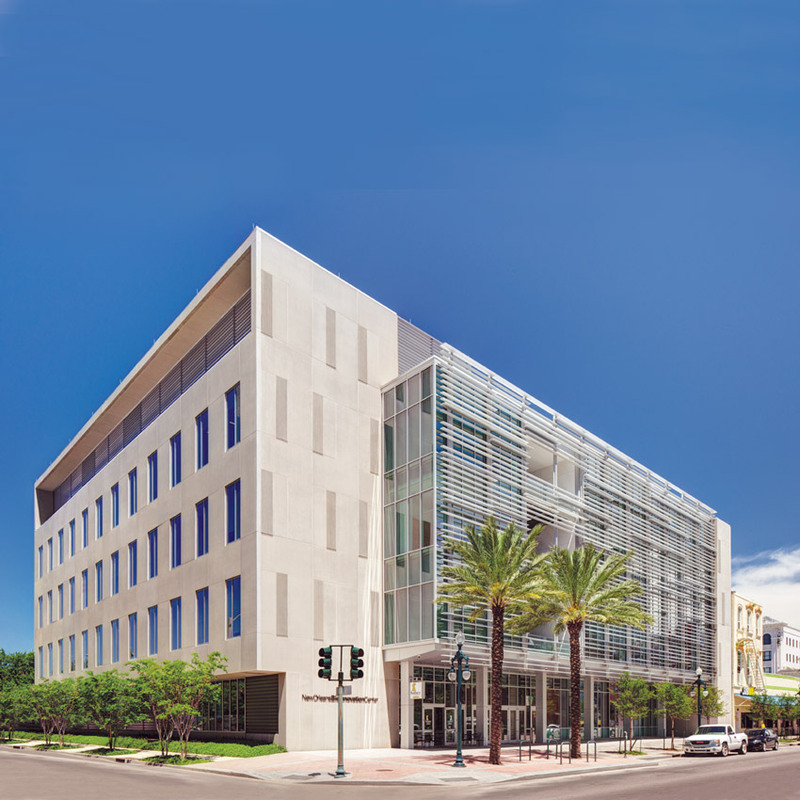 A performance study of the BioInnovation Center in New Orleans provides even more details of how lightweight precast concrete systems meet the demands for stringent aesthetic and green building standards. Strategies that maximized performance for the New Orleans LEED Gold BioInnovation Center included the choice of a high-performing, lightweight modular precast concrete wall system designed to meet LEED Gold standards. 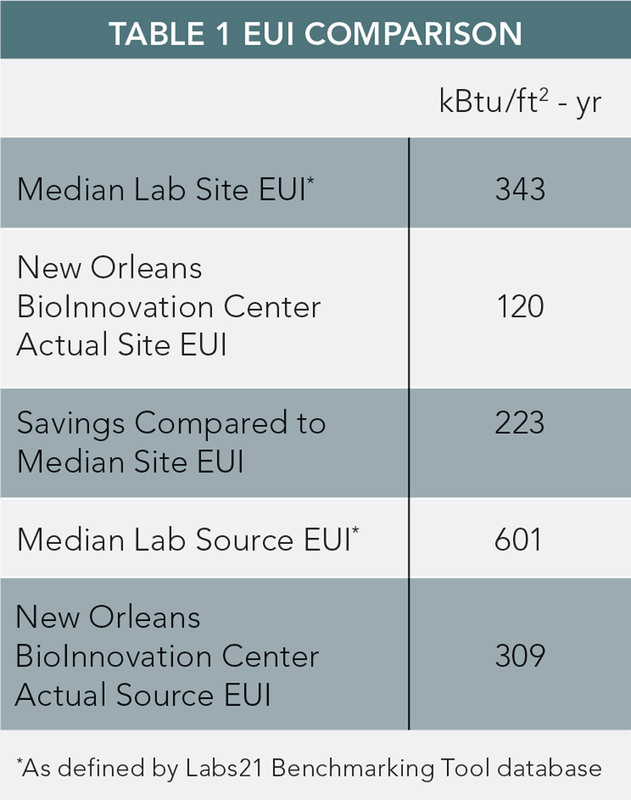 In spite of a challenging program, climate, and location on a brownfield site, The New Orleans BioInnovation Center has been honored with numerous green building awards. This project is the first Louisiana laboratory to obtain the LEED Gold status and is a 2015 AIA Top 10 Green Buildings Award winner. Most of the credits obtained for LEED Gold certification of this project were related to both the siting and thermal savings. Benchmarking the energy utilization intensity (EUI) as defined by ENERGY STAR as the annual use of energy per unit area of the BioInnovation Center against median lab EUI data. Among several criteria, an award-winning Top 10 project should manage “energy flows and energy futures.” As documented in the award profile, “This project uses less energy per square foot than 89 percent of the buildings in the Labs21 benchmarking database of over 400 lab/office buildings nationally, 67 percent below the median EUI (343 kBtu/square foot/year). To achieve these high-performance thermal savings, the design team made strategic decisions that required an interweaving of site orientation with system design and material choices. After evaluating the building envelope with consultants, the team selected a modular, precast concrete panel wall system integrated with high-performance glazing and sunscreens. Modeled by computer and in the field, the opaque panelized precast panels comprise approximately half of the building envelope. According to José Alvarez, AIA, LEED AP, NOMA, principle at Eskew+Dumez+Ripple, the 30-by-10-foot panels were modeled together with the windows and sunscreens to assure as much as possible a consistent thermal break between exterior and interior. The team reports that the 2-inch-thick precast cladding with 3½ inches of shop-applied, closed-cell foam insulation (R-21) provides continuous insulation, a continuous air barrier, and moisture control behind a perimeter stud-frame wall in a composite exterior wall system. According to Alvarez, the precast panels could also have incorporated prefabricated windows; however, to achieve the desired window to wall ratio, pattern, and panelization of the separate systems, it was impossible to integrate the systems at the factory. The design team worked with the manufacturer to develop the detailing for the integration of the windows and the modular concrete panels at the site to achieve similar control and quality of the assembly. Envelope modeling demonstrates that even with 68 percent glazing, the main entry facade is only the equivalent of 18 percent glass, thanks to the incorporation of the sunscreen and the highly insulated precast.2 The lightweight precast concrete wall system provides a continuous R-19 closed-cell spray foam, minimizing thermal bridging. The architects describe the program intent to be “urban acupuncture.” The 65,000-square-foot biotech lab is located on Canal Street and is a nonprofit incubator that supports life science entrepreneurs and economic growth. The institute provides state-of-the-art incubator labs and office facilities and to date has assisted with the creation of more than 200 new companies and over 400 jobs, raising $93 million in capital funding. The client requested that the team explore LEED certification, and the architect recommended measures that would lower operating costs without impacting the schedule and meet LEED Gold. Computer modeling identified both high and low payback opportunities and helped the team develop strategies for both passive and active interventions. The final cost of the environmental solutions was equivalent to less than 2 percent of the project cost, and the payback was less than three years. Some of the most obvious passive environmental strategies, such as limiting glazing to the Southwest in this hot and humid climate, were not possible due to the prominent location in the city and the desire to provide a transparent open facade. The urban setting required a system that could be easily constructed with a fast track schedule. The site also was located on poor soils, and a lightweight construction system was necessary to limit the cost of construction. The challenges of high-energy loads from equipment loads were met with active mechanical systems integrated with the building’s program. 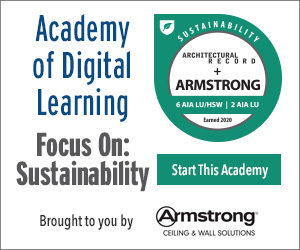 Choosing a high-performing modular wall system was an easy decision for the architects, says Mark Ripple, AIA, LEED AP, principal of Eskew+Dumez+Ripple. “For the cladding, we wanted a durable, hurricane-proof, and opaque system,” he says. One that “would allow a fine architectural surface and yet be lighter in weight than traditional, heavier precast.” A typical precast assembly weighs 78 pounds per square foot; however, the chosen lightweight system weighed only 28 pounds per square foot, allowing for smaller cranes and a faster construction schedule. According to Ripple, “The system has a lower carbon footprint than alternatives, and the structures supporting it can be lighter, which is important in our soft soils of Southern Louisiana.” This decision provided savings in related structural framing, moment connections, and foundations while still meeting strict hurricane codes. A precast concrete wall panel section is designed to meet thermal requirements and built in a factory-controlled setting. The project also received first place in the 2012 Gulf South Precast/Prestressed Concrete Association’s Top Projects awards. The innovative frame for this project is mounted outboard of the floor edge. Then it is used after erection to receive drywall and other interior finishes, eliminating the cost of a traditional knee wall and opening up an additional 4 inches of available floor space around the entire perimeter. A thorough performance case study of this project is published in the Winter 2016 High-Performance Magazine. Manufacturers are developing new lightweight precast concrete wall systems to meet the challenges of sustainable designers.